Arizona author Carly Kade’s first book, “In the Reins,” has been an Amazon best seller for more than 10 weeks. It's an EQUUS Film Festival Literary Award Winner for Best Western Fiction and earned her a loyal group of followers. Married with a full-time job as Manager of Strategic Talent for a Fortune 200 Energy Company, she shows her Paint horse and is mom to two adopted dogs, but Carly still finds time to write. In fact, "Cowboy Away," the sequel to her first book will be out this year. She juggles a successful career and pursues her dream as a freelance author, and today, Carly is going to tell us how she does it! Carly, you have a beautiful Paint horse! Tell us about your fur babies. Sissy is the one I always dreamed of owning. She is a Paint mare, and her registered name is Im Gonna Kiss You which couldn’t be closer to the truth. She is the most loving horse I’ve ever known and has been the inspiration for Faith in the In the Reins series. I became Sissy’s owner when she was young and did a lot of her training myself (with the help of a good coach and a lot of horse training books) so the lessons learned through those experiences helped bring Faith’s training to life in the book. Sissy and I share a very close bond much like Devon Brooke and Faith do. Sissy is a lot like Faith because she is forever forgiving of my equestrian mishaps and loves me unconditionally. If you’ve taken a tour of my website or followed me on my Carly Kade Creative Facebook page, you’ll notice Sissy stands in as Faith in my promotional videos for In the Reins. I do all the marketing for the book so it helps to have my own horse to work with as I film the footage. I also have 2 wonderful adopted dogs. Jovi after Bon Jovi and Jagger after Mick Jagger because my hubby and I love music. You have a full-time job and you launched your own career as an author. What pushed you to write a book? I have always enjoyed creative writing, but I never set out to be an author of equestrian fiction. It just kind of happened when cowboy/horse trainer McKennon Kelly showed up as a poem. That poem ended up being the intro to In the Reins. Then the story seemed to beg me to tell it, but I still wondered whether I should write a book or if I even could. Writing a book is scary! You put your creative self on the line for people to hopefully enjoy, but also to judge. From there, I just wrote the novel that I wanted to read. Beverly Cleary once said, “If you don’t see the book you want on the shelves, write it.” I think I’ve read everything in existence about horses and romance. However, I couldn’t find many horse book series written about my particular discipline. I wanted to read a love story themed around the type of horse shows that I liked to compete in. There are a lot of equestrian novels out there focused on dressage or jumping or rodeo, but I hadn’t found many that focused on Western pleasure competitive horse showing at breed shows like Quarter Horse, Paint, Pinto or the Palomino Horse Circuits. Did the story line come first, or did you start with a premise and work from there? In the Reins began with the poem about McKennon Kelly, then I wrote the ending of the book first, and from there I wrote chapter by chapter in order. Writing Cowboy Away was SO different. I let the book lead me, and it had me jumping all over the place! One day I would be working on page 14 and then the next I’d be on page 101. The book came to me in pieces because every member of the Green Briar bunch had a story to share. For the writers listening, how did you develop characters that unfold and evolve over the course of several chapters? I don’t always know where my characters are going to take me. I let them lead and write their journey down as it comes. I don’t force a twist or a turn. My character development just comes naturally when I tap into that special zone and let my heart (and the characters) guide the writing. My history with (and rich knowledge of) horses is definitely a reason why I think other horse lovers have been drawn to my books. I know what it feels like to enter a show pen and be nervous. I know what it feels like to feel stuck with my horse’s training. I know what it feels like to swoon over a cute cowboy. Giggle! Tell us about the process of publishing. Did you edit it yourself? Seth Godin once said, "The book that will most change your life is the book that you write." Boy, was he right about that! I didn't make the decision to self-publish lightly. After some extensive research, I decided to self-publish my first novel and skip the conversation about my book being too specialized to market. Equestrian fiction authors have legendarily been told that their books (with an equine twist) are too niched. With great power comes great responsibility. Self-published authors often get a bum rap for not being diligent during the editing process. Now, that we have the opportunity and freedom to self-publish our own work it is up to us to make sure it is up to snuff when we hit that publish button. My advice (especially for self-published authors) is to edit, edit then edit some more! Even after editing, look into having the book copyedited. Use beta-readers that you trust and who will give you honest feedback. It may prolong your release date but it is so worth it to know you put the very best version of your book into the hands of your readers. Make the investment to ensure your work is at its very best before you share it with the world. You published your own book, right? How did that work? As a self-published author, I love that I get to say how things go ... I hire the editors and proofreaders who work on my novels. I work with the designers of my book covers. I conduct my own video shoots. I arrange events. I handle my own marketing via various author pages, my website and my social media channels. I determine the price and positioning of my books. I appreciate that self-publishing allows me freedom with my creativity ... I especially like that can write at my own pace. decided to publish through Createspace, an Amazon Company. They have services that help format the book for print and ebook. Your website offers a lot of information, promoting your own work and other writers. Talk to us about how you decided to market your book that way, and give a hand up to other authors. I think it is very important to support fellow authors. Recently, I saw a graphic on Twitter that said, “Other authors are not my competition. I stand with them, not against them.” I strongly agree with this statement. It makes my spurs jingle when authors unite. I’ve learned so much from other authors and appreciate how unique each of our writing journeys is. I think it is so important to support each other and share knowledge among us. We are stronger working together to expose this “niche” genre of ours. When dreamers band together and support each other anything is possible. You can’t do it on your own. 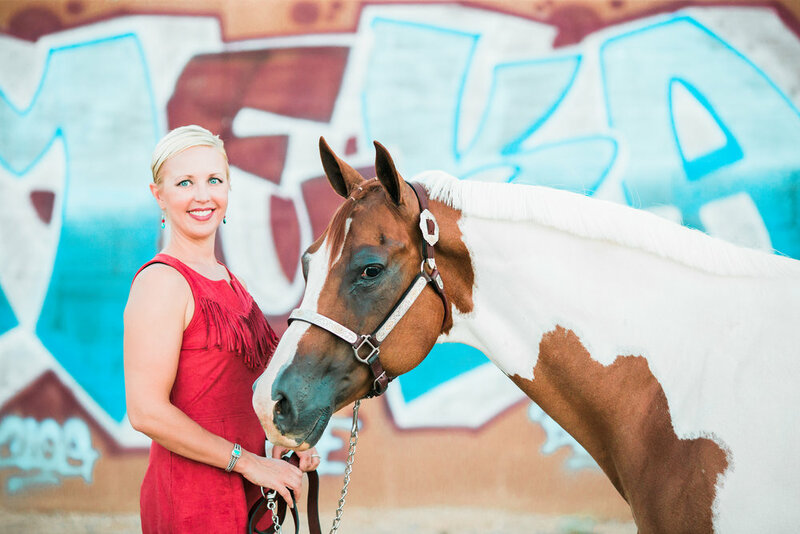 In order to give back to the community, I host an Equestrian Author Spotlight on my blog where I interview other equine authors. Here’s to horse books! I don’t know anything about writing a book! What were your challenges? How did it feel to finally see the hard copy of your effort? It was the best day of my life. I couldn’t believe I did it. I created something that no one had ever read before. My imagination was in print! The best part about writing is the opportunity to create stories that make people feel. Before I am a writer, I am a reader. I read just about everything … non-fiction and fiction, but I am a sucker for a good romance. I know how I feel when I get lost in books. I wanted to write a book perfect for getting lost in. I like chapters to end with cliffhangers that keep me hooked and saying “oh just a few more pages.” I intentionally write my books with short chapters, and I make sure when the chapter ends I’d want to turn the page. I love hearing in reviews that readers are staying up into the wee hours of the night to finish In the Reins. So many people have told me they finished it in a day. I LOVE BOOKS like that and am so happy that I’ve been able to write that kind of book for my readers. You’re about to release the sequel. Was that process any easier? It’s always a challenge balancing a corporate life with a creative one, but I found writing Cowboy Away a little easier because I had already written a book. I think getting the first book written is always the toughest because your mind can play tricks on you. The secret was sticking to the morning writing routine that I established while writing In the Reins. Having scheduled time for my creativity really helped move the sequel forward. I am not a morning person, but the commitment to my morning routine keeps my creativity alive. If you could offer budding authors advice, what would you say? Follow your dream! I’ve found that when something seems scary it’s usually the path I need to take. If I had one piece of advice to offer writers on getting a book written I would have to steal a page from Nike’s playbook and say, “Just do it!” I sometimes wonder if I'll have anything to write when I sit down to my morning writing sessions but then I JUST DO IT and the words magically come. Tell our listeners how to find you and your books online!